If you listened to vinyl in the 60’s and 70’s, there’s a good chance you listened to the latest comedians on your stereo or record player. If that era pre-dates you, just know that some of the greatest comedy of the day was heard among friends who played records until they scratched and skipped beyond recognition. In a world of music, comedy albums showed respectably on Billboard charts…names like Bob Newhart, the Smothers Brothers, Bill Cosby, George Carlin, Richard Pryor, Cheech and Chong, Monty Python, Firesign Theatre, and Steve Martin all got a lot of laughs on vinyl. The lighter side of vinyl also has a serious side. And a sturdy one. Vinyl record albums were fragile, susceptible to breakage, melting, and scratching. Not so with today’s vinyl. Plastic Products Mfg has transformed it into something that’s virtually unbreakable and never cracks. Introducing Style VACH Slanted Vinyl Sign Holders, practically indestructible and light weight at the same time. Here’s something the new Vinyl Sign Holder has in common with those classic comedy albums: custom covers. Back in the day, record sales often reflected the artwork or photos on the cover. Same is true still in CDs. The new Vinyl Sign Holder can also be a canvas for your eye-catching graphics and artwork. In standard form, the white foam board-type backing has a clear vinyl slip covering for your inserts. But if you’d rather opt out of the vinyl cover, Plastic Products Mfg can print your graphics on the front face. It’s a nice option to consider if you want to grab attention in high foot traffic areas. 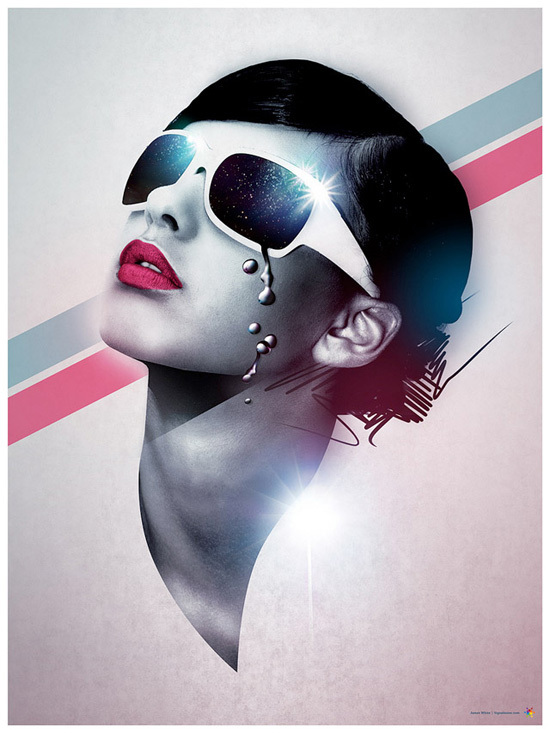 Here’s another appealing quality of Style VACH. Notice it’s a Slanted Vinyl Sign Holder, which gives it the perfect angle to meet the eye. At 8-1/2” wide x 11” high, your material gets an ideal spotlight and total visibility. Of course, this type of plastic is versatile, easily formed, and sizes can be customized on higher quantities. Two more attractive features of this slanted white plastic sign holder with its clear rigid cover: price and ease-of-use. Vinyl is a very economical material that keeps your cost down. Plus, the light weight makes shipping a minimal expense. Upon arrival, Slanted Vinyl Sign Holders can be put to work straight out of the box. Inserts slide in easily from the bottom, keeping your print material protected. Plus, it never falls over on the countertop! As always, a Plastic Products Mfg Customer Service Specialist will be glad to help with dimensions and a quote on Style VACH Slanted Vinyl Sign Holders. And don’t think we’d leave you without at least a one-liner, here’s one from the great Flip Wilson: “If you think nobody cares if you’re alive, try missing a couple of car payments.” Mic drop. Vinyl may not be as widely seen and heard as records and turntables fade into history, but this extremely tough, durable, and versatile plastic is stronger than ever in other areas…like Vinyl Sign Holders at Plastic Products Manufacturing (PPM). As we continue to upgrade and innovate economical, user-friendly styles in our Vinyl Sign Holder line, their list of practical business applications is also growing even beyond countertop POP Displays. One style in particular delivers easy pop-up assembly with a vinyl front and chipboard easel back. VACH085110 is an extremely cost-effective design with protective attributes for your print material…whether it’s promotional OR for internal applications in busy corporate facilities, office complexes, warehouses, shipping areas, schools, and laboratories. At 8-1/2 x 11 inches, the Vertical Slanted Vinyl Sign Holder is the optimal size for promotions, signage, and directional guidance. The options really are endless. Three-sided closure with bottom entry also keeps print items secure and makes loading simple. Plus, they never break! That virtual indestructability is a key feature in Vinyl Sign Holders, one reason why they make such an affordable investment. The easel backing folds flat to make them easy to store and save on shipping. They’re lightweight and that too keeps shipping rates lower…especially when you consider consolidated shipping and bulk order price breaks. Other Vinyl holder benefits? Earlier we mentioned going beyond the countertop, and this is where the durability and versatility factors once again enter the picture. Vinyl Sign Holders can easily mount to any available wall space, opening more options through in-store marketing and signage applications. If you have limited counter space but plenty of empty wall space, you can target specific areas to guide foot traffic accordingly. 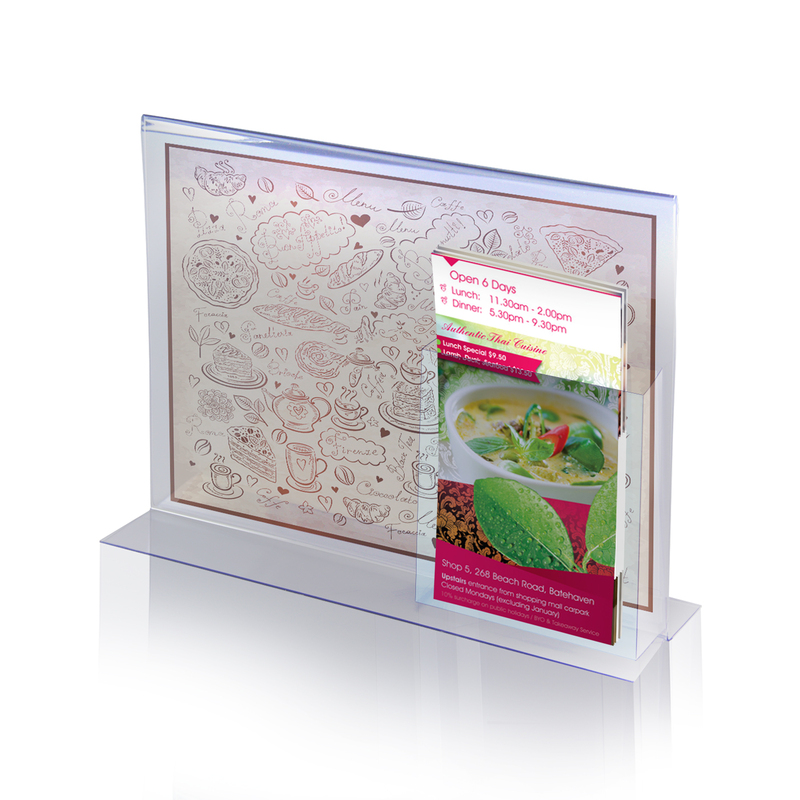 Add another dimension using Vinyl Sign Holders with a clear Brochure Pocket attachment. This value-added feature is excellent for use in “grab and go” environments like trade shows and kiosks. Use your 8-1/2” x 11” slicks in the Sign Holder to grab attention…and the 4” x 5” Brochure Pocket to disseminate info “to go.” This Vinyl Sign Holder is perfectly slanted to meet the eye and provides an inexpensive way to get the word out. When budgets are tight and operational costs are on a shoestring, you don’t have to sacrifice marketing and internal signage. PPM’s Vinyl Sign Holders deliver the functionality, versatility, and durability you need, yet in a most budget-friendly, cost-efficient manner. If you’re among our many long-time customers, you already know what to expect from our 30 years in POP Display experience. Check out your Vinyl Sign Holder options in our online catalog and grab a cart because www.plasticproductsmfg.com never closes and products are ready to ship now! Vinyl – OFF the Charts and ON Display with Vinyl Sign Holders, Poster Holders, and Brochure Pockets! A few months ago, the Huffington Post released a “World Giving Index” – results from a study of 153 countries by the Charity Aid Foundation. The study measured just how giving these countries are based on three criteria: volunteerism, the helping of strangers, and money donations. According to the study’s results, America catapulted from fifth in 2010 to first in 2011 as the world’s most generous country with about $212 billion in charitable contributions. The U.S. was followed by Ireland, Australia, New Zealand, the UK, Netherlands, and Canada. Americans have always had a giving nature and not just during the Holiday Season or when a natural disaster brings out America’s best – apparent during the recovery efforts after Hurricane Sandy slammed the northeast. It’s proven time and again all throughout the year as a wide spectrum of worthwhile charitable organizations tirelessly help those in need. It’s also true that many charities get by on a shoestring-and-a-prayer kind of budget. With slim margins available for a number of operational necessities, establishing good vendor partnerships with flexible suppliers can be crucial. Display holder options are a prime example. When called upon for a cost-effective sign holder that’s unbreakable and gets the message across yet is also inexpensive and costs little to ship, we were ready to answer the call. The solution? Vinyl…vinyl sign holders, vinyl poster holders, and vinyl brochure holder pockets, to name a few. at a low cost…they’re very lightweight. larger versions for high visibility items 30” x 40” and even 43” x 32” are available. Charities aren’t the only organizations who find versatile, low-cost vinyl ideal in their operations. In many display applications, clear vinyl provides optimum visual acuity in settings where harder acrylic simply may not be the most practical option. Those slant back vinyl sign holders are in high demand by a number of our regular customers, from Goodwill to See’s Candies, the legendary California based confectioners who have been making sweets for over 90 years! Added appeal comes with additional features…like the dimension Vinyl Brochure Holder Pockets provide. They peel and stick to almost any surface – great and functional attachments to sign holders, poster holders, and of course, brochure holders themselves. They ship flat at bargain rates and fold easily upon arrival. 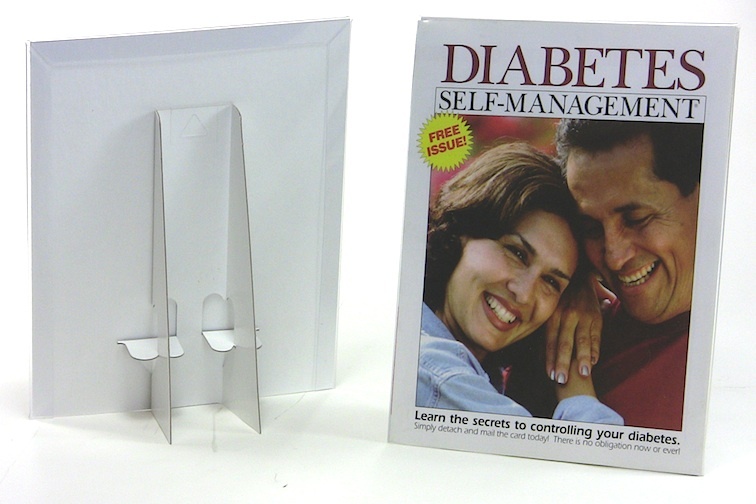 We also have a PRE-Folded Vinyl Brochure Holder Pocket, ready for use straight out of the box in five standard sizes. Like their unfolded counterparts, this holder pocket simply peels and sticks to almost any surface. Quantity shipments of as many as 252 pre-folded brochure holder pockets in the smallest 3-1/2” x 1-1/2” size are further proof of their cost-effective value. We know operational costs and tight budgets come into play a lot this time of year. But that doesn’t mean you have to rein in the good word your organization stands for! The holiday season is especially important to those we’ve described here, including everyone from our great friends at Goodwill to the amazing candy makers at See’s Candies, and helping them broaden their appeal is our pleasure. When you need an alternative display that still looks great but costs a little less, think VINYL! 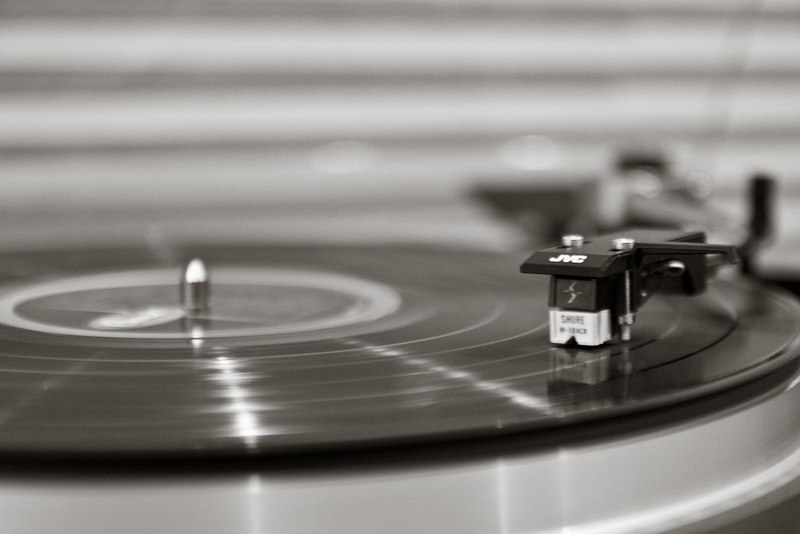 It’s not just for record players but can still inspire everyone in sight like every chart-topper!